Investigation: Biology 2 Aim: To investigate how light intensity affects the rate of photosynthesis of pond weed at different distances away. 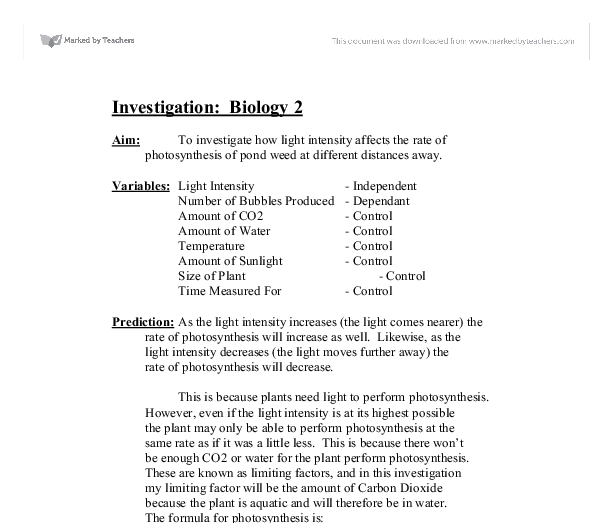 Variables: Light Intensity - Independent Number of Bubbles Produced - Dependant Amount of CO2 - Control Amount of Water - Control Temperature - Control Amount of Sunlight - Control Size of Plant - Control Time Measured For - Control Prediction: As the light intensity increases (the light comes nearer) the rate of photosynthesis will increase as well. Likewise, as the light intensity decreases (the light moves further away) the rate of photosynthesis will decrease. This is because plants need light to perform photosynthesis. However, even if the light intensity is at its highest possible the plant may only be able to perform photosynthesis at the same rate as if it was a little less. This is because there won't be enough CO2 or water for the plant perform photosynthesis. These are known as limiting factors, and in this investigation my limiting factor will be the amount of Carbon Dioxide because the plant is aquatic and will therefore be in water. The formula for photosynthesis is: Sunlight Water + Carbon Dioxide ---------------- Oxygen + Sunlight Chlorophyll Limiting Factor = Scientific: - The amount of CO2 will affect the rate of photosynthesis Basis because it will be the limiting factor during my investigation. ...read more. Step 3- Collect the gas produced by the bubbles in the top of the test tube. Step 4- Take a lighted splint place over the mouth of the test tube. If the gas is oxygen then the flame stays alight. Conclusion: - My results from my investigation seem fairly accurate because there is the same number of dots on each side of my line of best fit. I used two sets of results to get an average because they will be more accurate. I can conclude from my results that as the lamp is placed closer to the plant therefore the light intensity is higher that there is more photosynthesis been performed and therefore more bubbles. - This helps prove that my prediction was correct because I predicted that as the light intensity increases the number of bubbles would increase. I was also correct to predict that as the light intensity decreases the number of bubbles decreases. - This is because light is needed to perform photosynthesis, as it is the main energy source, which is used to build the glucose molecules. However, there is a limiting factor in my investigation, which is the amount of CO2. 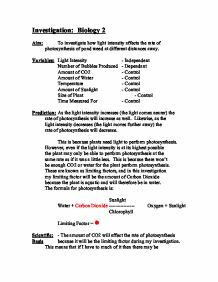 This will mean that there will be a point when the plant cannot perform photosynthesis any faster however high the light intensity is. ...read more. - Control Size of Plant - Control Time Measured For - Control Method: Step 1- I will collect my equipment and pour 1 litre of water into a beaker. Step 2- Cut a piece of pond weed 5cm long and place it into a funnel. Attach the funnel to the bottom of the beaker using plastercine. Place a test tube over the top of the funnel so that the bubble so that the bubbles can clearly be seen in the test tube. Finally, add Sodium Hydrogen Carbonate to add CO2 to water. Step 3- Cool the water to 5oc, and place a lamp 50cm away from the beaker and leave to settle for a minute. Count the number of bubbles for a minute and note down the number. Step 4- Heat the water to the next temperature which is 10oc. Note down the number of bubble after a minute. Step 5- Repeat the investigation again with each different temperature to get two sets of results. Step 6- Work out the average number of bubbles for each temperature of the water in the beaker. I will use the following distances for the distance between the lamp and the beaker:- - 5oc - 10oc - 15oc - 20oc - 25oc - 30oc - 35oc - 40oc - 45oc - 50oc - 55oc - 60oc ...read more. Confirm which factors increases or decreases the rate of photosynthesis. * Carbon dioxide comes form the xylem vessel and oxygen comes from the palisade layer. * Glucose is then released out form the palisade layer into the phloem, where the water is absorbed and taken in by the palisade layer. I only did the experiment twice and thus my results are less reliable. I also changed the distance movement by taking the lamp forward 100mm instead of 50mm each time to accommodate the new range of measurements that I wanted to do. of light, it has the highest amounts of CO2 to photosynthesis with. In the Preliminary Experiment I performed, I got the highest Number of Bubbles of all 3 experiments. At 35cm, the pondweed produced 13 oxygen bubbles through photosynthesis where as Experiment 1 only produced 2 and Experiment 3 produced 12. Safe Test: This isn't a particularly dangerous experiment but simple lab rules such as wearing safety glasses must be kept to. Also, the lamp will get quite hot so it should be avoided from touching. Apparatus The necessary equipment for this experiment is as follows: 1. How temperature affects the rate of photosynthesis. The electrons emitted from photosystem II travel to photosystem 1 and stabilise it. [Text adapted from Page 20 of OCR A2 Biology Textbook]. To stabilise photosystem II, photolysis of water occurs to form hydrogen ions, oxygen and electrons are released. It's affected by the amount of carbon dioxide. Carbon dioxide and water are raw materials. Water is not in short supply in a plant but only 0.03% of the air around is carbon dioxide, so it's quite scarce. The temperature also affects it. Chlorophyll is like an enzyme so it works best when it's warm but not too hot.